« How much Oil does the world have left ? Posted on June 26, 2009 under Technology. Continuing on from where I left off on part 4, I’ll now look at some trends that I have noticed about the E-book Reader market. iPhones and other smart phones are fast becoming popular as alternatives to E-book readers. In fact Wired.com contends that the iPhone surpasses Kindle in the popularity stakes. Whether this trend will continue to hold in the future though remains to be seen. A limitation of the current crop of e-book readers is that they show text and images in black and white only. This is largely due to a limitation of the e-ink technology used. However we might just see color e-book readers soon. Fujitsu released it color e-book reader dubbed Flepia in March this year. In addition to this the first color e-ink displays might soon enter commercial mass production by the end of next year . So look forward to reading your favorite magazine in color on your e-book reader in the near future. Netbooks get cheaper by the day and present a compelling alternative to shelling out all that cash for an e-book reader. However they are still limited by their power-guzzling LCD screens which limit battery life to a few hours at best as opposed to page turns for the e-book reader. This may change though as research is on to develop hybrid netbooks with a e-reader mode that makes use of an e-ink display for reading. Google has scanned millions of books as part of its Google Books project. This includes many thousands of difficult to find and out of print books. I wonder if Google will soon come out with an e-book store that can be used in conjunction with e-book reader applications running on its Android OS. I think this would definitely change the game drastically, especially if Google offers the books at a competitive price. In spite of all the wonderful things that e-book readers are capable of, I believe that there are some pressing issues that need to be addressed before this market can really take off. First up the cost of e-books and content needs to be reduced drastically. 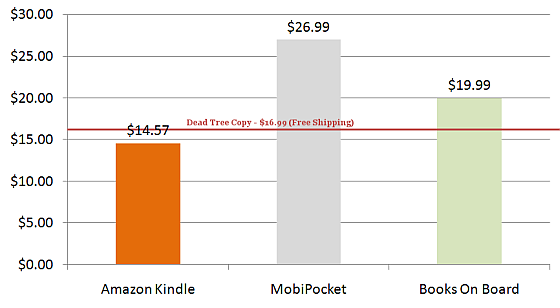 Today e-books are as expensive as their dead tree counterparts and for no apparent reason. I would have thought that the publishing, shipping and inventory costs saved by offering an e-book should have reduced the price significantly. To see how bad the pricing is, I compared the pricing of Guillermo Del Toro’s The Strain on various e-book sites. The results are illustrated in the graph. As you can see at $16.99 with free shipping, the dead-tree book is way cheaper than some e-book versions. Amazon offers a lower price, though I suspect they take a loss of $6-$7 on each item they sell. (Note: These prices are about a month old and have changed. You can get the Kindle version of the Strain for $9.99 at Amazon today. Still this is illustrative of the pricing issue, and I am glad that we are seeing some changes in pricing at Amazon). So, I feel unless content for e-book readers reaches iTune equivalent pricing, say under $10 for the latest books and under $5 (or even lower) for the older titles, e-books aren’t going to really take off. The biggest issue is that only a fraction of the books at major book retailers are in the e-book format. Amazon is trying to address this by allowing consumers to request publishers to bring out Kindle copies, but I don’t think that is enough. Unless more content becomes available, I doubt that e-books and by corollary e-book readers are going to take off. I think the publishers and the retailers really need to work on this together. Another concern is the durability of e-book readers and formats. Dead-Tree books practically last forever if you treat them right. In fact, I actually own old books and magazines published in the 60’s and 70’s that are still very readable (meaning they haven’t turned to dust after 30-40 years). I don’t know if e-book readers are going to be as durable. And if I would have to shell out about $100-250 every couple of years on a new device, I’d definitely think twice before buying one. Another thing is that there are a plethora of e-book formats today. I don’t know if content in some of the formats is going to be readable say 5 years from now. Also I wonder what happens when the e-book reader fails due to hardware errors (Say Flash memory corruption).Would I lose all my DRM content and have to re-purchase everything? Or would backing up the device periodically constitute “Fair Use”? Or will the content provider have a backup service to take care of the problem? (I think some of the content providers let you re-download a copy in case of corruption.) These issues definitely need to be addressed. That brings us to the end of this five part series. I hope you found it informative enough. This entry was tagged under: E-Book Readers, Technology. Both comments and pings are currently closed.